Background: The metabolic syndrome (MS) is defined as a cluster of cardiovascular risk factors, including central obesity, dysglycemia, hypertension (HPN), elevated triglycerides (TGs), and reduced high-density lipoprotein cholesterol (HDL-C). MS increases the risk of cardiovascular disease and all-cause mortality. Objective: This study aims to estimate the prevalence of MS and its components among nondiabetic Libyan females using the definition proposed by National Cholesterol Education Program (NCEP) Adult Treatment Panel III (ATP III). Methods: A total of 122 randomly selected nondiabetic Libyan females were included in the study. Detailed medical history was obtained from all participants. Blood pressure, weight, height, waist and hip circumference were measured. Body mass index and waist–hip ratio were calculated. Fasting blood glucose (FBG) and lipid profile were collected. Standard oral glucose tolerance test with 75 GM glucose was performed. The MS was defined by ATP III and International Diabetes Federation criteria. Results: According to NCEP definition, the prevalence of the MS in the study group was 42.6%. The most common component was abdominal obesity (67.2%). FBG was ≥ 100 mg/dl in 47.5%. The prevalence of both HPN and low HDL-C was 45.9%. About 26.2% of the participants have their TG ≥ 150 mg/dl; all were MS patients. Conclusions: The prevalence of MS and cardiovascular risk factors were high among Libyan females. Public health authorities and health-care providers should implement strategies for prevention, screening, and management of cardiovascular risk factors to reduce the burden of its potential complications. There have been several definitions of MS, but the most commonly used criteria for definition at present are from the National Cholesterol Education Program (NCEP) Adult Treatment Panel III (ATP III), the International Diabetes Federation (IDF),, and the World Health Organization (WHO). According to the NCEP ATP III definition, which was updated by the American Heart Association and the National Heart, Lung, and Blood Institute in 2005, MS is present if three or more of the following five criteria are present: abdominal obesity, dysglycemia, elevated blood pressure (BP), elevated triglycerides (TGs), and reduced high-density lipoprotein cholesterol (HDL-C). IDF criteria require central obesity as a prerequisite for the diagnosis of MS in addition to any two of the above-listed criteria. MS affects around 20%–25% of the world population and its prevalence has been globally increased, as a result of Westernization of lifestyle with less physical activity and increased obesity.,,, The prevalence of MS varies widely between populations from 8% to 43% in men and from 7% to 56% in women around the world. Genetic background, socioeconomic status, diet, and lifestyle influence the prevalence of the MS and its components. In females, menopause and estrogen deficiency appears to be independent predisposing factor for the development of most of the components of the MS., Higher frequency of MS among females than among males was reported in studies from Turkey; Iran, Jordan, Saudi Arabia, and Tunisia. The aim of this study is to determine the prevalence of MS and abnormal glucose regulation among a sample of nondiabetic Libyan females examined in a pilot screening program that was conducted at the endocrine department of the Tripoli medical center. This study was carried out in accordance with the principles of the Helsinki Declaration. Formal approval was obtained from institutional authorities. 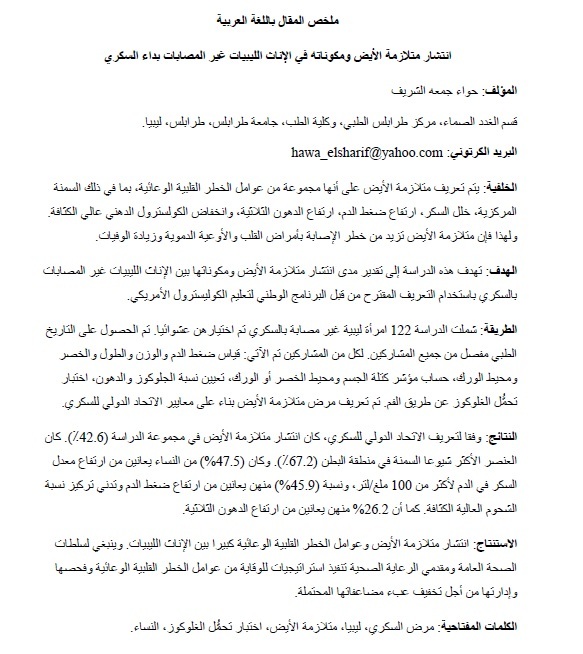 Female visitors to medical wards of the Tripoli Medical Center, during the study period (June 2010 to December 2010), were approached and asked to participate in the study. Only those who agreed to be part of the study were included. The purpose of the study and the procedure involved was explained to all participants and verbal consent was taken. One hundred and twenty-two Libyan women were enrolled in the study, females with a history of diabetes and pregnant individuals were excluded from this study. Sociodemographic data collected included age, marital status, level of physical activity, fruit and vegetable consumption, and smoking history. Past medical history of hypertension (HPN), hyperlipidemia, and other chronic diseases and family history of diabetes was also recorded. Weight and height were measured in light clothes and no shoes. Body mass index (BMI) was calculated as weight in kilogram divided by height squared in meters. BMI was classified according to the WHO classification. Waist circumference, and hip circumference were measured in centimeters (cm), and waist-to-hip ratio (WHR) were calculated; WHR >0.85 in women indicates central obesity. The BP of each participant was recorded using a standard mercury sphygmomanometer after the participant had been seated for at least 15 min. Normal fasting glucose <100 mg/dl, impaired fasting glucose ≥100 mg/dl but <126 mg/dl, diabetic fasting glucose ≥126 mg/dl. Normal glucose tolerance <140 mg/dl, impaired glucose tolerance ≥140 mg/dl but <200 mg/dl, diabetic glucose tolerance ≥200 mg/dl. The NCEP and ATP III criteria were used to identify women with MS.
MS is present if three or more of the following five criteria are present: waist circumference ≥88 cm; elevated BP: systolic BP ≥130 mmHg and/or diastolic BP ≥85 mmHg or receiving treatment for HPN; elevated TGs ≥150 mg/dL; reduced HDL-C <50 mg/dL (for women), and elevated fasting glucose ≥100 mg/dL. The IDF criteria require central obesity as a prerequisite for the diagnosis of MS in addition to any two of the above-listed criteria. Statistical analysis was performed using the Statistical Package for the Social Science (SPSS Inc., IBM, US), 19th version. Continuous variables are expressed as mean ± standard deviation. Categorical data are expressed as numbers and percentages. Student's t-test or Mann–Whitney test was used to compare continuous variables. Qualitative variables were analyzed with Chi-square test. A P < 0.05 was considered statistically significant. According to NCEP-ATP III criteria, only 11.5% of our participants have no components of MS, 23.0% had two components, and 42.6% have three or more components of MS. According to IDF diagnostic criteria, 45.9% of all participants have MS [Table 1]. 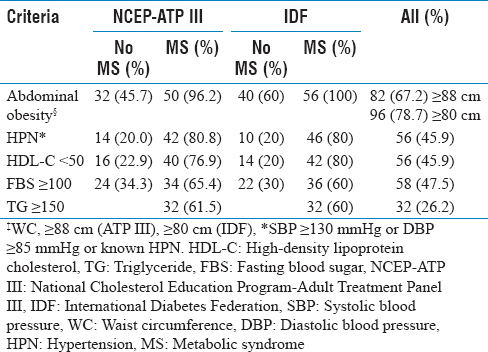 The prevalence of each component of MS using the two sets of criteria (NCEP-ATP-III and IDF) are shown in [Table 2]. It is clear that significantly higher percentage of participants with MS had abdominal obesity, showed lower HDL-C, higher fasting blood sugar, and TGs when compared to non-MS participants. [Table 3] summarizes the clinical and metabolic characteristics of the participants with and without MS. 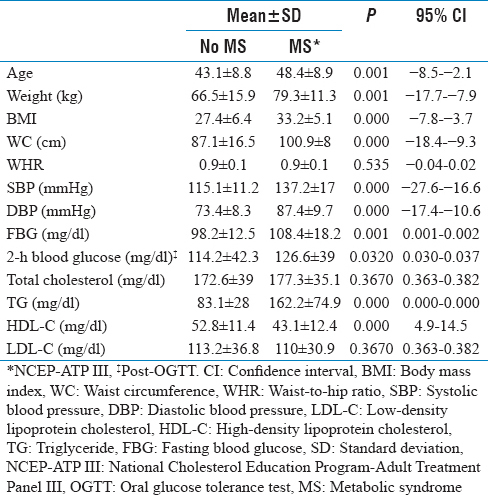 It is clear that there is a significant difference in all measures except for waist circumference and LDL-C levels between participants with and those without MS.
[Table 4] displays the prevalence of MS by age group, first-degree family history of diabetes, BMI, blood sugar regulation, and level of physical activity. The prevalence of MS among those <40 years of age was 20% compared to 60% in those ≥50 years. About 30% of those with negative family history of diabetes have MS versus 50% in those with positive family history. None of the normal-BMI participants have MS, while 59.1% of those with higher BMI have MS. Diabetic fasting blood sugar was significantly higher in participants with MS compared to participants without MS (14.5% versus 2.9%, respectively). Most of the participants with MS (42.3%) showed impaired GTT, but none showed diabetic GTT. All participants with MS showed lower physical activities of more than 3 h/week when compared with participants without MS.
Our study showed high prevalence of MS among Libyan females, the percentage of women who had MS was 42.6%, according to NCEP definition and 45.9%, according to IDF definition. This is comparable to other, regional studies using the NCEP criteria. In a study conducted in a family practice clinic at Jordan University Hospital, using NCEP-ATP III criteria, the prevalence of MS among women aged 25–80 years was 41.0%. A similar high prevalence of MS among women (42%) was reported by a large community-based national health survey including 17293 Saudi men and women, aged 30–70 years old. Based on IDF criteria, the prevalence of MS among Emirati women (>20 years old) has been reported to be 45.9%. A retrospective analysis of the files of 820 adult patient at the center of diagnosis of Rabat found that the prevalence of MS among Moroccan female was 40.12%. A lower prevalence of MS has been reported among Omani women (23.0%) and among Egyptian women (26.6%). Genetic predisposition, age, standards of living, and lifestyle behavior of the studied population influence the prevalence of MS and its components.,,, In our sample, MS was significantly associated with older age, the presence of first degree relative with DM, and low level of physical activity. The prevalence of obesity is high among our study sample, as 45% were obese. This might explain the high rate of MS in our study, where significant association between BMI and presence of MS were found. On the other hand, none of the normal-BMI participants had MS, while 59.1% of those with higher BMI had MS. The STEPWISE surveillance for chronic diseases conducted in Libya by the WHO in 2009 showed a 40.1% rate of obesity (≥30 BMI) among Libyan nationals (age 25–64 years). There is good evidence that abdominal obesity is important in the development of insulin resistance and the MS.,, The most common component of MS in our study sample was abdominal obesity, 67.2% of our sample had a waist circumference ≥88 cm, this is similar to the reported rate by a cross-sectional community-based study included 124 Egyptian females, aged ≥35 years where 66.1% of the studied group had a waist circumference ≥88 cm. Lower prevalence rate of abdominal obesity has been recorded among Omani females (44.3%), and Saudi females (44%).,, while higher rate was reported among Jordanian female (73.5%). The second most prevalent component in the present study was HPN. About 45.9% were either known hypertensive or have BP ≥140/90 mmHg. HPN is an important CV risk factor worldwide, and its prevalence is estimated to be 25% in 2000 and projected to increase by almost 40% in 2025. In the US National Health and Nutrition Examination Survey, the prevalence of HPN (BP ≥140/90 mmHg) in American women was 30.1%. In a systematic review of 61 published articles related to the prevalence of CVD risk among women in Saudi Arabia, the average prevalence of HPN (BP ≥140/90 mmHg) was 21.8%. Moreover, in a systematic review of the 13 studies, the estimated prevalence of HPN among ten Arab countries was 29.5%. In Libya, a surveillance by the WHO showed 35.6% prevalence rate of HPN among 1666 Libyan females aged 25–64 years. HPN is a silent disease and our results showed that only one-third of those with high BP were previously diagnosed. Nearly 45.9% of the study sample have HDL-C <50 mg/dl, comparable results were reported by a cross-sectional community-based study of 124 Egyptian females, aged ≥35 years old in a rural area where 44.4% of the study participants had low HDL. On the other hand, higher prevalence of low HDL-C reported among Omani female (75.4%), Palestinian women (56%), Jordanian women (56.1%), Emirati females (48.8%), and Saudi women (81.8%). About 47.5% of our study population had FBG ≥100 mg/dl. Type 2 diabetes and abnormal glucose regulation are closely associated with the MS. Clustering of the cardiovascular risk factors associated with MS predicts the development of diabetes and CVD. In a cross-sectional study involved 99 randomly selected Libyan adult patients with type-2 DM, 92% of the patients had the MS according to the ATP III criteria. The MS can be prevented by interventions that modify diet and physical activity and control weight. We found a higher frequency of MS among those with low level of physical activity. The low rates of physical activity reported by our participants is comparable to reports from other Arab countries.,,,, Social restraints and lack of open spaces for outdoor activities such as walking are among the factors that contribute to the low level of physical activities among Libyan females. Moreover, the risk of MS increased by sedentary behavior such as watching television, especially in older patients., The results of Finnish and American prevention of diabetes studies have shown the marked clinical benefits associated with weight reduction and increased physical activity in terms of prevention of type 2 DM., Therefore, the risk of MS can be reduced by increasing physical activity, especially higher intensity activities such as fast walking. MS is highly prevalent among the studied Libyan females, affecting 42.6%, where abdominal obesity was the most frequent component of the syndrome. MS is associated with increased morbidity and mortality and early detection and treatment of its components are important for the prevention of CVD. Promotion of healthy lifestyle and education about the risks associated with sedentary behavior and active or passive smoking should be part of any management strategy for persons with or at risk for MS. Moreover, public health education is crucial to raise the public awareness of the risk factors for MS and its components. Grundy SM, Cleeman JI, Daniels SR, Donato KA, Eckel RH, Franklin BA, et al. Diagnosis and management of the metabolic syndrome: An American heart association/National heart, lung, and blood institute scientific statement. Circulation 2005;112:2735-52. Wilson PW, D'Agostino RB, Parise H, Sullivan L, Meigs JB. Metabolic syndrome as a precursor of cardiovascular disease and type 2 diabetes mellitus. Circulation 2005;112:3066-72. National Cholesterol Education Program (NCEP) Expert Panel on Detection, Evaluation, and Treatment of High Blood Cholesterol in Adults (Adult Treatment Panel III). Third report of the national cholesterol education program (NCEP) expert panel on detection, evaluation, and treatment of high blood cholesterol in adults (Adult treatment panel III) final report. Circulation 2002;106:3143-421.
International Diabetes Federation: The IDF Consensus Worldwide Definition of the MS; 2006. Available from: http://www.idf.org/metabolic-syndrome. [Last accessed on 2017 Aug 06]. Zimmet P, Magliano D, Matsuzawa Y, Alberti G, Shaw J. The metabolic syndrome: A global public health problem and a new definition. J Atheroscler Thromb 2005;12:295-300. Alberti KG, Zimmet PZ. Definition, diagnosis and classification of diabetes mellitus and its complications. Part 1: Diagnosis and classification of diabetes mellitus provisional report of a WHO consultation. Diabet Med 1998;15:539-53. Alberti KG, Eckel RH, Grundy SM, Zimmet PZ, Cleeman JI, Donato KA, et al. Harmonizing the metabolic syndrome: A joint interim statement of the international diabetes federation task force on epidemiology and prevention; national heart, lung, and blood institute; american heart association; world heart federation; international atherosclerosis society; and international association for the study of obesity. Circulation 2009;120:1640-5. Kaur J. A comprehensive review on metabolic syndrome. Cardiol Res Pract 2014;2014:943162. Bhandari R, Kelley GA, Hartley TA, Rockett IR. Metabolic syndrome is associated with increased breast cancer risk: A systematic review with meta-analysis. Int J Breast Cancer 2014;2014:189384. Cameron AJ, Shaw JE, Zimmet PZ. The metabolic syndrome: Prevalence in worldwide populations. Endocrinol Metab Clin North Am 2004;33:351-75. Haffner S, Taegtmeyer H. Epidemic obesity and the metabolic syndrome. Circulation 2003;108:1541-5. Shen J, Goyal A, Sperling L. The emerging epidemic of obesity, diabetes, and the metabolic syndrome in China. Cardiol Res Pract 2012;2012:178675. Carr MC. The emergence of the metabolic syndrome with menopause. J Clin Endocrinol Metab 2003;88:2404-11. Ben Ali S, Belfki-Benali H, Aounallah-Skhiri H, Traissac P, Maire B, Delpeuch F, et al. Menopause and metabolic syndrome in Tunisian women. Biomed Res Int 2014;2014:457131. Sliem HA, Ahmed S, Nemr N, El-Sherif I. Metabolic syndrome in the middle east. Indian J Endocrinol Metab 2012;16:67-71.
WHO. Obesity: Preventing and Managing the Global Epidemic. Geneva: World Health Organization; 2000. American diabetes association. Standards of medical care in diabetes-2017. Diabetes Care 2017;40:S1–38. Yasein N, Masa'd D. Metabolic syndrome in family practice in Jordan: A study of high-risk groups. East Mediterr Health J 2011;17:943-8. Al-Nozha M, Al-Khadra A, Arafah MR, Al-Maatouq MA, Khalil MZ, Khan NB, et al. Metabolic syndrome in Saudi Arabia. Saudi Med J 2005;26:1918-25. Malik M, Razig SA. The prevalence of the metabolic syndrome among the multiethnic population of the United Arab Emirates: A report of a national survey. Metab Syndr Relat Disord 2008;6:177-86. El Brini O, Akhouayri O, Gamal A, Mesfioui A, Benazzouz B. Prevalence of metabolic syndrome and its components based on a harmonious definition among adults in Morocco. Diabetes Metab Syndr Obes 2014;7:341-6. Al-Lawati JA, Mohammed AJ, Al-Hinai HQ, Jousilahti P. Prevalence of the metabolic syndrome among Omani adults. Diabetes Care 2003;26:1781-5. Mahfouz EM, Hassan EE, Kamal NN, Abd Elrazik EF. MS among rural women. Ann Clin Exp Metabol 2017;2:1021. World Health Organization STEPwise Surveillance of Noncommunicable Disease Risk Factors in the Eastern Mediterranean Region; 2012. Available from: http://www.bit.ly/126n6Z1. [Last accessed on 2013 Jun 7]. You T, Yang R, Lyles MF, Gong D, Nicklas BJ. Abdominal adipose tissue cytokine gene expression: Relationship to obesity and metabolic risk factors. Am J Physiol Endocrinol Metab 2005;288:E741-7. Al-Qahtani DM, Imtiaz SO. A comparison of the prevalence of MS in Saudi adult females using two definitions. Metab Syndr Relat Disord 2006;4:204-14. Egan BM, Li J, Hutchison FN, Ferdinand KC. Hypertension in the United States, 1999 to 2012: Progress toward healthy people 2020 goals. Circulation 2014;130:1692-9. Alshaikh MK, Filippidis FT, Baldove JP, Majeed A, Rawaf S. Women in Saudi Arabia and the prevalence of cardiovascular risk factors: A Systematic review. J Environ Public Health 2016;2016:7479357. Tailakh A, Evangelista LS, Mentes JC, Pike NA, Phillips LR, Morisky DE, et al. Hypertension prevalence, awareness, and control in Arab countries: A systematic review. Nurs Health Sci 2014;16:126-30. Abdul-Rahim HF, Husseini A, Bjertness E, Giacaman R, Gordon NH, Jervell J. The MS in the west bank population: An urban-rural comparison. Diabetes Care 2001;24:275-9. Alshkri M, Elmehdawi R. Metabolic syndrome among type-2 diabetic patients in Benghazi-Libya: A pilot study. Libyan J Med 2008;3:177-80. Baceviciene M, Luksiene DI, Cesnaitiene VJ, Raubaite S, Peasey A, Tamosiunas A. Dose-response association between physical activity and MS. Cent Eur J Med 2013;8:273-82. Edwardson CL, Gorely T, Davies MJ, Gray LJ, Khunti K, Wilmot EG, et al. Association of sedentary behaviour with metabolic syndrome: A meta-analysis. PLoS One 2012;7:e34916. Lindström J, Louheranta A, Mannelin M, Rastas M, Salminen V, Eriksson J, et al. The finnish diabetes prevention study (DPS): Lifestyle intervention and 3-year results on diet and physical activity. Diabetes Care 2003;26:3230-6.